Welcome to the online site for Learning Place Bio-Farm! This site aims to help teachers, parents, students, administrators and farmers find inspiration and practical advice for using organic farms as learning arenas. 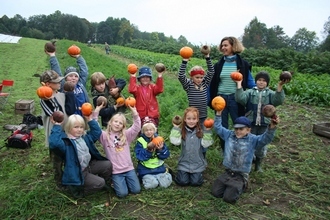 The authors of this online guide are researchers and educators from six different European countries that have worked with schools and kindergartens as well as other educational institutions and public administration to make experience on organic farms available. We hope this guide can help you find possibilities for farm visits and prepare for learning about sustainable food production and environmental solutions for responsible agriculture..
As an introduction to this guideline, we focus on some general questions that we have encountered in the work with farms and schools/kindergartens. Answers to these questions can be a help in clarifying the motives for farm visits and providing a basis for discussion with colleagues and parents. how schools and kindergartens can use organic farms as unique learning arenas. why learning on an organic farm leads to a better understanding of sustainability. how farms benefit from student visit.